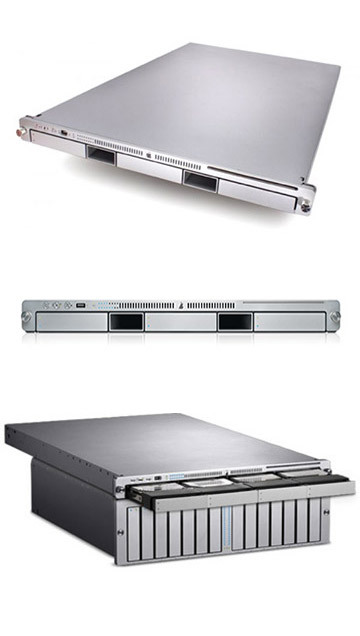 This BTO 'Build to Order' model Xserve Xeon 2.66 quad core (Intel Quad) runs dual 2.66GHz Dual Core Intel Xeon 5150 processors with 4MB of shared level 2 cache per processor plus 1.33GHz 64-bit frontside buses. The base configuration has 1.0GB of special DDR2-667 ECC "fully-buffered" memory installed in the form of a pair of 512MB FBDIMMs, a 7200 RPM 80GB SATA hard drive mounted in the special Apple "drive module", a slot-loading 24x DVD-ROM/CD-RW "Combo" drive plus ATI Radeon X1300 PCI Express graphics processor running 64MB of VRAM. Ports and communication come via 1 mini-DVI, 2 USB 2.0 ports, 2 Firewire 800 ports, 1 Firewire 400 port.